Air Costa, the Vijayawada based regional airline, has realized an operating profit in the month of December, 2014. ATF sales tax at Andhra Pradesh, which was reduced to 1% from 16%, has positively benefited the airline. Three out of four aircraft rotation patterns have at least one stop at Andhra Pradesh, which allows the airline to tanker fuel out of the state. The Embraer E170s, which used to pay a flat sales tax of 4%, now pay only 1% within the state and 4% outside the state. The airline’s tie up with Sovika Group to carry a target of 500 tonnes of cargo a month in the unused belly space of the aircraft has also contributed to the airline’s revenue stream via ancillary revenues starting December. It is estimated that the airline makes around INR 1 Cr per month for 500 tonnes of cargo. The airline flies 34 flights a day between 15 city pairs, connecting 9 stations with four Embraer E Jets – two 112 seat E190s and two 67 seat E 170s. Of these, the airline enjoys a monopoly on three pairs: Jaipur-Chennai, Tirupati – Vishakhapatnam, and Vijayawada-Vishakhapatnam sectors, and a duopoly on five others. On the other sectors, the airline enjoys competition from just two other airlines. 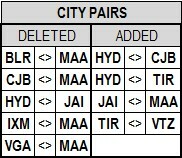 Two out of 15 routes are Tier II – Tier II city pairs, while just two city pairs are Tier I – Tier I. The other 11 are Tier I – Tier II city pairs : the market that has the highest growth potential. The airline stopped flying the Bangalore- Chennai sector – a short, crowded sector that is not suited for a 100 seat regional jet in the light of stiff competition especially from economical 70-80 turboprops and higher capacity Boeing 737-800 and A320 aircraft. While the turboprop is the right sized aircraft with favorable economics, for jet aircraft, this sector is unviable. However, deploying a Boeing 737-800 or an A320 on this sector can be commercially managed through low airfares that fill up an entire aircraft to break even. The E190 cannot compete due to its very significantly higher operating costs than an turboprop and its higher cost per seat compared to a mainline jet, on such a short, already crowded sector. The network has been restructured to eliminate unprofitable routes and unfavourable patterns. It is also possible that the disruptions faced by SpiceJet across its network could have benefited Air Costa. The airline shares two duopoly sectors with SpiceJet and three other sectors with SpiceJet and other airlines. Another important factor that would have contributed to Air Costa’s profit is the high demand for domestic air travel in December. Tirupati, for instance, is preferred by many in December due to the favorable weather and the coincidence with the holiday season. When compared to the 2014 Summer schedule, the airline has stopped flying five city pairs and added four city pairs. The most notable change has been in the drop in the number of Chennai connections. Connections to Chennai from Coimbatore, Bangalore, and Vijayawada have been snapped. Madurai as a destination was dropped soon after opening. The connection between Hyderabad and Jaipur has been snapped. The frequency of flights between Hyderabad and Chennai have dropped from 3 flights a day each way to just one. Tirupati was opened towards late September. Direct Hyderabad – Coimbatore, Hyderabad – Tirupati, and Tirupati – Visakhapatnam sectors were commenced, and the Hyderabad – Vijayawada frequency was doubled. Air Costa has stopped its three / four way routes : Bangalore – Jaipur – Hyderabad – Chennai (and the return), and Bangalore – Ahmedabad – Chennai (and the return), replacing these with direct Bangalore – Jaipur-Bangalore, Bangalore – Ahmedabad – Bangalore, Chennai – Ahmedabad – Chennai, and Chennai – Jaipur – Chennai routes. From 40 planned flights a day in summer ’14, the airline today flies 34 flights a day, dropping routes that were unprofitable. Compared to the Summer schedule, the aircraft utilisation has dropped, from an average of 12:53hrs to 11:42hrs per aircraft, a drop of 1:11hrs. E170s, which were planned for 11:00 -11:25hrs in summer presently are utilised to 9:45hrs-10:00hrs a day. E190s, which were planned for 14:30hrs -14:40hrs a day in summer today fly for 12:50hrs – 14:15hrs. Chennai, from 10 departures a day as per the summer’14 schedule, has reduced to just three. Bangalore and Hyderabad have the highest departures – seven a day. 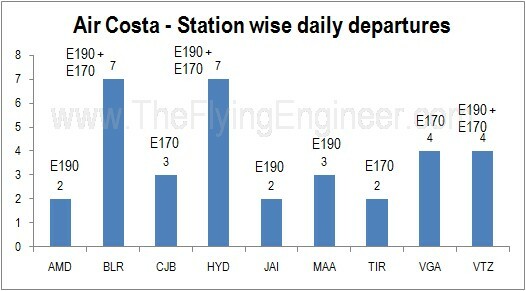 It may be prudent for Air Costa to shift its E190 aircraft base from Chennai to Bangalore both in light of its importance and the benefits handed out by Bangalore Kempegowda International Airport for operators who station 50% or more of their fleet in the city and fly more than a million passengers annually through the airport. Presently, Air Costa flies a total of about 26,000 passengers into and out of Bangalore, every month. The E190s contribute to about 17,500 passengers per aircraft per month. Should 4 additional E190s be stationed at Bangalore to fly point to point routes out of Bangalore, then the airline will cross 1 million passengers movements per annum at Bangalore. According to earlier plans, the airline was to have received the 5th E190 (7th aircraft) in December 2014.